Today the construction industry is in essentially the same place as the U.S. manufacturing industry was in the early 1990s - trapped between the declining margins of a competitive environment and a lack of the efficient processes needed to grow. In the early 1990s, manufacturing used the same basic methods and processes for planning, tracking, producing, shipping and selling products that had been in place since the 1960s. Paper and human reporting were everywhere. Critical data arrived to decision makers desks too late to be useful. Operational control was more black magic than science, and communications was glacially slow. Then in the mid 1990s, manufacturing companies began to make investments into computer-driven data and communications systems, and the industry’s “Information Revolution” began. Efficiency increased as did productivity and profit margins. Capital and operational expenditures were leveraged by enormously scalable technology solutions, and variable costs fell dramatically. Today, with the right choice of technology and process change, construction companies can experience similar increases in efficiency, productivity, and profits. It all starts with effective fleet management. Theft mitigation: Closely related to traditional vehicle tracking, theft mitigation allows a construction company to know if a piece of equipment is being stolen. Data gathered for theft mitigation includes when a piece of equipment is started outside of normal working hours, when a piece of equipment is moved (with or without engine start), when the equipment is being transported and where the equipment is at any time. Productivity: Managing productivity means being able to understand when and how much a piece of equipment is running, idling, working, moving, etc. This information should be specific to the tasks the piece of equipment is performing as well the project on which it is working. For example, a backhoe might be working but not moving about the job. The system needs to account for this. Maintenance: Knowing how much a piece of equipment has been running, idling, and working allows a construction company to know an equipment’s hour meter reading very accurately and in real-time. In addition, sensors on the equipment can identify when and measure how long or how far a piece of equipment is being run in reverse, how many lifts or dumps have been made and a host of other activities. This knowledge makes it possible to accurately employ a very effective preventive maintenance program. Operator behavior: While you can’t directly measure operator behavior, you can infer it from other data collected while the operator is using a monitored piece of equipment. Knowing when a piece of equipment is started in the morning, how much time the equipment runs during the day, how much time the equipment idles during the day and how much it worked can be interpreted to get a reasonable view as to the operator behavior. This can be a particularly powerful when management has the ability to look back over months of data and identify trends. 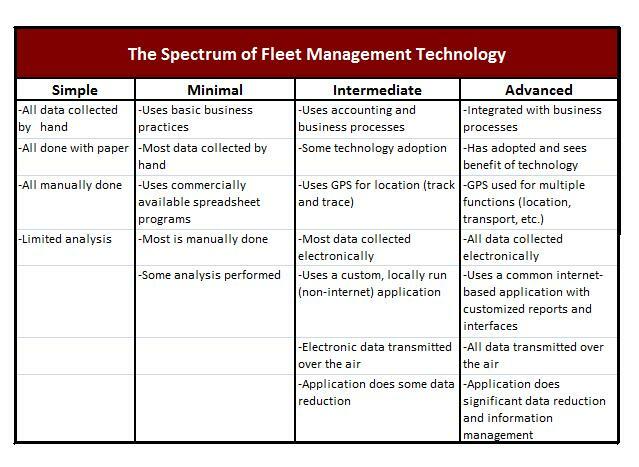 Technology is a tool that can be used to great success in measuring, documenting, and overseeing fleet management activities. There is not, of course, one single technical solution for fleet management that can be instituted for all construction companies. 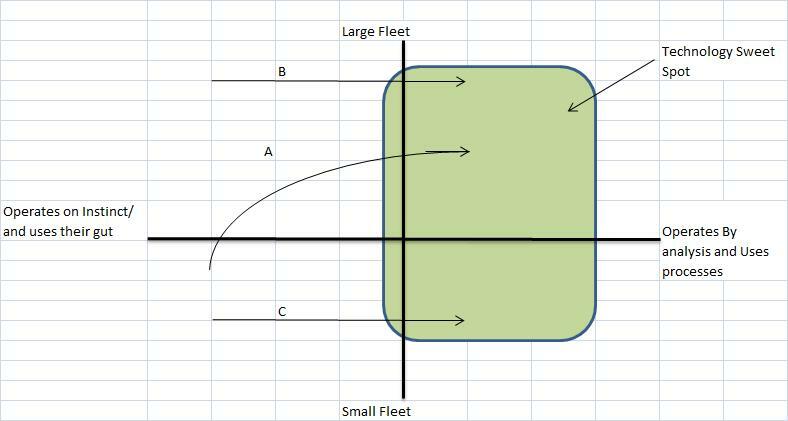 Solutions to fleet management range from the simple to the complex. This spectrum of technology options is illustrated in Figure 1. As can be seen on the “simple” side of the spectrum, keeping paper records and manually entering data is the norm. While it’s simple, it’s also very time consuming, inaccurate and routinely inconsistent. At the other end of the spectrum, advanced technology provides a complete end-to-end solution with remote, electronic collection of data, wireless transmission of the data to a back office and readily available application that converts the data collected into information. Some companies are perfectly well served by using simple technology, and others will benefit greatly from the advanced technology once it’s available. It all depends on the company, its goals and its environment. In the same vein, not all construction companies can benefit to the same degree from technology or, more accurately, not all construction companies are ready to adopt technology. Companies adopt technology in essentially the same way no matter what technology we are discussing. When computers or two-way radios were introduced to the workplace, they followed a technology adoption process. Fleet management technology is no exception. For construction companies, fleet size and company management methods combine to determine how, or if, new technology is adopted into a company’s operations. Figure two illustrates, in general terms, how construction companies adopt technology. Path “A” in figure 2illustrates how most construction companies adopt technology. The path is an evolutionary one. As a company grows in size and complexity, its need for processes and methods grows as does its need to adopt new technologies. Some companies, through acquisition or sudden growth, find that they have a large fleet of equipment but are lacking in methods and processes. These companies follow path “B” in the diagram. Finally, there are companies that have small fleets and also have either visionary management or an injection of “new blood” into the management team. These companies recognize that adopting new technology gives them a competitive advantage that can compensate for their smaller size. Companies like this follow path “C”.